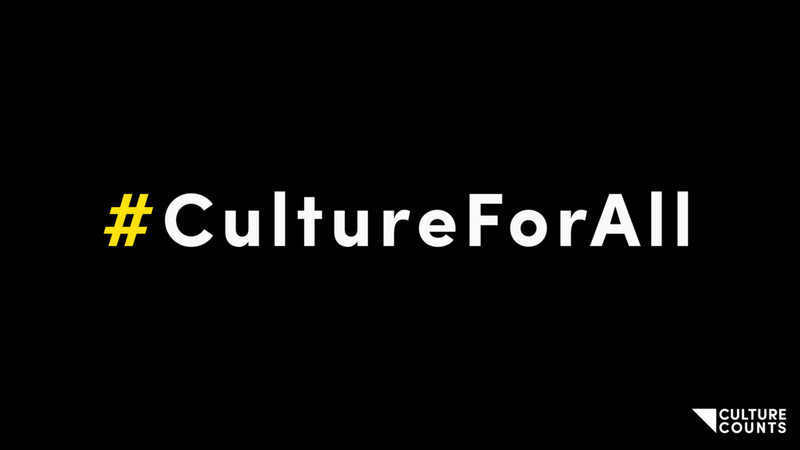 #CultureForAll - 2% of £2bn to deliver access to arts and culture. Over the next three weeks the Scottish Government will take crucial decisions that affect all our futures. We have been doing the maths; and the Cultural Sector has been cut by £48million in real terms since 2010. Culture Counts believes that this will impact on the delivery of #CultureForAll; as outlined in The Government's Programme for Scotland 2017/18. Particularly around the inequalities in the sector outlined in the Arts Diversity Survey. We are making the case for 2% of the £2billion (as announced in this week's budget) for the delivery of 'Culture For All'. This investment could make access to arts and culture a reality for people in Scotland. Click Here to tweet your support. "I support 2% of the £2bn for Culture. This investment could make access to arts and culture a reality for people in Scotland. We will be using #CultureForAll over the coming weeks. Please join in the debate online and show support and twitter love for the issues you agree with. We have a Twitter List of all Culture Minsters and Spokespersons here. Consultation - Diet Policy. A healthier future - action and ambitions on diet, activity and healthy weight. Culture Counts submission to CTEER in advance of Budget 2017.